In my experience it is absolutely necessary to keep doing my administration. If it is for my personal administration or my business administration. Why do I think that? Besides that I can get more value out of my admin when it is structured in a way I can analyze my spending and my income. In that way I can actually adjust! This (picture) is what happens when you do not manage your administration well and you come back from your awesome vacation. 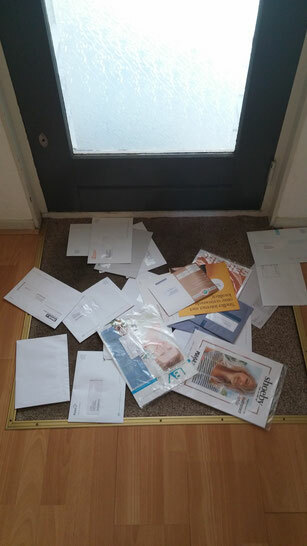 Too much letters and bills to open and to handle. You can reduce them with 90% just by having automatic payments only! That is one easy way of dealing with your administration. You find more tips below! I live by them because it works! 5 Tips for your administration! 1. Have a daily practice of checking your bank account. With this regular practice you will notice what comes in and goes out and when. Great way to get more clarity! 2. Take Action! Open your mail, read it and take action directly. Do not put it on a pile. You will only create a big paper mountain and a head full of thoughts. 3. Have a system that works for you. Aren’t you tired of figuring out your financial status every month again and again. Stop it! It does not work. Don’t have a system? Create one! 4. Set a monthly budget for yourself and track this budget within your administration. An awesome tool to see if you are on the right track and adjust along the way. 5. Have fun diving into the numbers once a month and notice where you can adjust. Let me know what is working for you! When you leave your email, you will receive more tips!